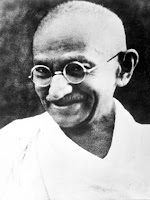 Am I the only one that thinks Ghandi is wearing a pair of one of those joke glasses with a novelty nose attached??? # posted by Pure Cork Boy : May 27, 2007 10:57 p.m. Yes, that's what it looks like! # posted by Betty the Sheep : May 29, 2007 7:56 p.m.